An opportunity to own a piece of the worlds first Fairtrade and Fairmined silver, available exclusively from CRED Jewellery, the fair trade jewellery pioneers. Back in 1996 a Human Rights and Fairtrade campaigner, Greg Valero, founded CRED selling jewellery made from recycled silver. He soon realised that a company with ethical principles needed to understand the dynamics of the jewellery trade. Since then he has been tirelessly striving to do just that. Following many years of pioneering work CRED Jewellery in partnership with Colombian mining collective Oro Verde™, developed transparent supply chains for gold, which formed the basis of the Fairtrade and Fairmined standard for gold in 2011. That year, Livia Firth, walked down the red carpet at the Oscars, wearing the first gold jewellery to be hallmarked with the Fairtrade and Fairmined dual stamp. 2 years on CRED Jewellery brings the world’s first Fairtrade and Fairmined silver to the UK, and to celebrate are launching an exclusive pendant to mark a turning point in the future of ethical jewellery. The Silver Ingot Pendant is a Limited Edition design by CRED Jewellery made from the world’s first batch of certified Fairtrade and Fairmined silver. 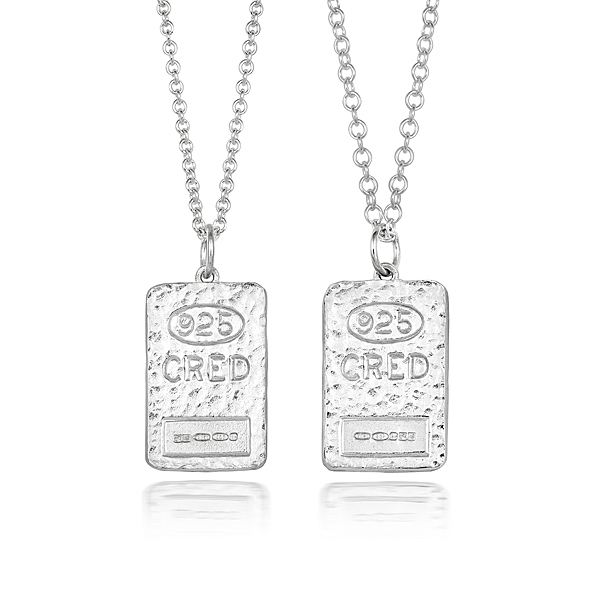 The exclusive pendant is shaped as an ingot and engraved with impressions of the hallmark stamps for Silver and the CRED mark. The ingot has the Fairtrade and Fairmined hallmark, along with the assay, silver and CRED hallmarks. The Limited Edition Fairtrade and Fairmined silver ingots will be available to buy from CRED Jewellery from today, Monday 25th February. To find out more about CRED Jewellery or to make a purchase visit CRED Jewellery. The following Human Rights Watch video shows just why Fairtrade and Fairmining certification is so import and how Greg Valero is hoping to bring the same standards to the USA. CRED Jewellery are the pioneers in fairtrade jewellery, leading the way in creating a transparent ethical supply chain whilst offering beautifully designed jewellery collections, wedding and engagement rings. Passionate about creating beautiful ethical jewellery, CRED believe that true beauty goes beyond aesthetics to encompass a responsibility to both people and the planet. Hi Susi, Blog followed, tweet tweeted and text sent! Really admire what you are doing. Kept it up, I’ll be following!